Whether through research training courses, senior honors theses or showcases like the Dietrich Undergraduate Colloquium, undergraduate students in CMU’s Dietrich College of Humanities and Social Sciences have opportunities to engage in research at every turn. And while they’re learning the nuts and bolts of this work—like how to ask the right questions, find relevant sources and present their findings—these students contribute to knowledge on diverse topics alongside the best and brightest in their fields. For her senior thesis, Hannah Tomio is working with Wendy Goldman, the Paul Mellon Distinguished Professor of History, on a historical analysis of the Soviet Union’s space program. Her work focuses on the Vostok 1, the first manned space flight with cosmonaut Yuri Gagarin; and the Lunokhod 1, the first robotic rover mission. Tomio is sharpening her Russian language skills by using primary sources from the sixties and seventies like magazines, state publications and propaganda posters. This is just one benefit of exploring a subject that isn’t covered by her coursework. “It’s given me a much better understanding of the research process, the expectations and requirements for graduate level work and the current trends in academia,” Tomio added. 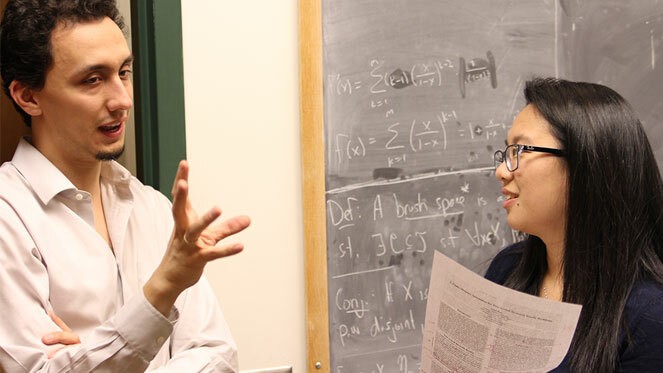 In collaboration with Assistant Professor of Philosophy Adam Bjorndahl, Ariel Rao is creating mathematical models that reflect how people make decisions in uncertain situations. This is a deeper exploration of the multi-armed bandit problem, which takes its name from the dilemma a gambler experiences when choosing from a set of slot machines that will deliver unknown rewards. Rao, a senior majoring in logic and computation, has also taken courses in the School of Computer Science’s Language Technologies and Human-Computer Interaction Institutes. According to Bjorndahl, she brings a unique perspective to the project – the first major research undertaking he has pursued with a student in his three years at CMU. Rao will present her research at a poster session during the 31st Association for the Advancement of Artificial Intelligence Conference, slated for February 2017 in San Francisco. Participating in research can also lead to funding and further opportunities. For example, the George and Elisabeth Ireland family established the Ireland Undergraduate Research Awards in 2015 to support high-quality undergraduate psychology research projects. “Hands-on research involvement is at the core of the CMU educational experience, and our undergraduate psychology program,” said Michael J. Tarr, head of the Department of Psychology. Pictured above: Assistant Professor of Philosophy Adam Bjorndahl and senior Ariel Rao discuss decision-making in uncertain situations.